Crank: Oh, man! This is my third oil change today. Something's wrong with me. 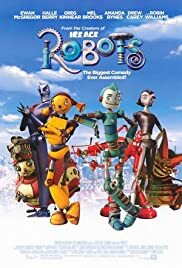 Robots is probably the most technically amazing computer-animated movie I've ever seen. When you stack it up against a movie like the original Toy Story, it's astounding how far they've come in about 10 years. There is a scene were a drum of tiny ballbearings falls over, and each ballbearing is rendered perfectly. Amazing. The voice acting in Robots is just fine, with the ensemble cast providing a nice mix of auditory delights(although I saw Jim Broadbent's (the dad in Bridget Jones') name in the credits and was unable to identify him in the movie. Greg Kinnear did a fine job and Ewan MacGregor was also decent. The biggest question mark was Robin Williams. Before the movie I found myself wondering how he could top the 'Genie' performance in Aladdin. The answer is he doesn't, but his character is responsible for a few VERY funny bits and I think he pulled it off well. Now humor in the movie... It was clear to me that at least 80% of the adults in the audience weren't getting many of the references. If you are old enough/smart enough to catch these, they are hilarious. 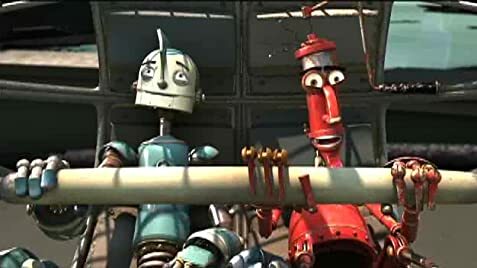 My favorite being when Rodney is repairing Bigweld's head and Bigweld is singing 'Daisy' very slowly. Priceless. All in all a great movie, and I also suspect this movie will improve with subsequent viewings. Where a Shark's Tale just becomes tiresome after one viewing, I am looking forward to viewing this movie again. Lastly, my 6 year-old son LOVED the movie. We saw it in IMAX and it completely blew him away. 70 of 99 people found this review helpful. Was this review helpful to you?